Damn. Damn damn damn damn. I put on running shoes for the first time since Jan 8 this evening, to test these new traction aids, test clothing and see how well my achilles was progressing in preparation for the race tomorrow. The answer? Clothing great. Traction aids probably fine. Achilles tendon? Total disaster. Apparently it is responding well to massage and ultrasound. But I did fail the “lift on one foot without pain test. I’m very pleased with myself, yes. I did the distance three or so weeks ago, but using the 10 minutes running, one minute walking training method the Running Room uses for their long slow distance runs. Today I did it straight out. And I beat my 1:40 target time. Lately I’ve been pretty proud of how I’ve been running. 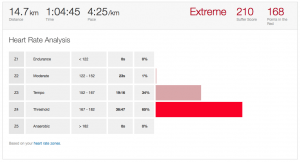 Managing longer distances at faster pace, and feeling great complete with normal heart rate the next day. Yay me.